Set in the scenic Andes Mountains, Sacha Ji, meaning 'beloved mountain', is designed as a sanctuary and retreat, a place you can take advantage of the special organic food, relaxation therapies, feng-shui architecture and emerge feeling rested, restored and re-energised. Add to this the fine scenery and clear mountain air and you have a recipe for health and well-being. Yoga sessions, meditation and healing treatments such as reiki, reflexology, Ayurveda, massage and Andean cleansing are available, administered by experienced therapists, as well as a hot tub and polar pool to increase circulation and boost energy levels. The location is a key part of the lodge's wellness programmes, fusing all 4 elements: Imbabura Volcano, San Pablo Lake, the summer winds and the equatorial sun. You are encouraged to spend time exploring the local area, taking in the natural beauty and culture, which enhances the effect of the wellness programmes. Food is another important aspect of your stay at Sacha Ji. The majority of the ingredients used are organic, with much grown in the lodge gardens within sight of the dining room. Meals are based on traditional recipes, reinterpreted for the modern day. There is a reading room with a wide screen TV used for showing films, and with Wi-Fi internet access. The bar serves fresh fruit juices, herbal teas and a selection of wines. The lodge's flat roofs provide space to relax, either lying back in a hammock or sitting and admiring the views. The lodge has 11 guest rooms of varying sizes, all en-suite. Wooden floors, Andean rugs and local photographs add character, while open fires, climate control, thermal windows and blackout curtains make this a cosy haven. 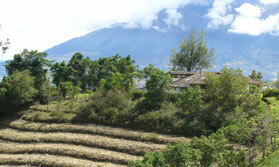 All rooms have views of Imbabura Volcano and Lake San Pablo. Open: Sacha Ji is open all year. Location: Sacha Ji is in Imbabura Province in the north west of Ecuador, 98kms north of Quito. The nearest town is San Pablo del Lago, and the famous market town of Otavalo is nearby. Quito airport od about 41kms from Sacha Ji. The lodge is 2,960ms above sea level. Rooms: There are 11 rooms. Most have either 1 king size bed or 2 twin beds plus a sofa bed, triples have 3 twin beds, and the suite has 1 king size bed, a sofa bed, sitting room and small kitchen. All rooms have an en-suite bathroom with hand basin, flush toilet and a shower. Many have open fires and the others have energy efficient heating systems to keep rooms warm. Blackout curtains help ensure a good night’s sleep. Ponchos are provided in each room for you to wear outdoors in cooler climes. Activities: These centre on well-being. Sacha Ji offers massages, reiki, reflexology, Andean cleansing, lomi lomi and Ayurveda. There are yoga classes and meditation sessions. The sweat lodge is open to groups of 10 and more people. The lodge also offers equine-assisted therapy, using horses for emotional growth. This is offered off site. There are special workshops and retreats during the year. Local activities include horse riding, walking and trekking, all with a guide, visits to sites of interest, craft and food markets and historic haciendas. Andean cookery courses can be arranged for groups. Facilities: There are treatment rooms for singles and couples, a large yoga room which can also be used as conference room, a hot tub and solar pool, gardens and an outdoor meditation area. There are roof terraces with hammocks and chairs. The lodge has a reading room with a big screen, a bar and a gift shop. There is a laundry service. Dining: Meals are eaten at individual tables in the dining room. Food is mostly organic and largely vegetarian though some meat dishes are available. Children: Sacha Ji is not suitable for young children. Communication: There is Wi-Fi internet access in the reading room, bar and the suite. Trek in the scenic lakes district in the Northern Andes, meeting local people and witnessing traditional skills and crafts.